Geological disasters will happen in cold regions because of the effects of freeze-thaw cycles on rocks or soils, so studying the effects of these cycles on the mechanical characteristics and permeability properties of rocks is very important. In this study, red sandstone samples were frozen and thawed with 0, 4, 8 and 12 cycles, each cycle including 12 h of freezing and 12 h of thawing. The P-wave velocities of these samples were measured, and the mechanical properties and evolution of the steady-state permeabilities were investigated in a series of uniaxial and triaxial compression tests. Experimental results show that, with the increasing of cyclic freeze-thaw times, the P-wave velocity of the red sandstone decreases. The number of freeze-thaw cycles has a significant influence on the uniaxial compressive strength, elastic modulus, cohesion, and angle of internal friction. 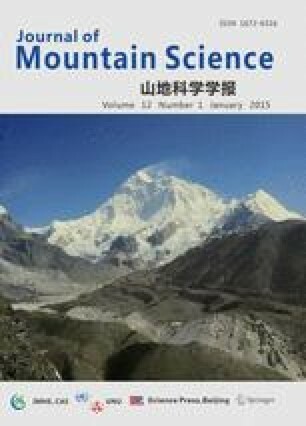 The evolution of permeability of the rock samples after cycles of freeze-thaw in a complete stress-strain process under triaxial compression is closely related to the variation of the microstructure in the rock. There is a highly corresponding relationship between volumetric strain and permeability with axial strain in all stages of the stress-strain behaviour.